"Divergent" is a book that I've been dying to read since it came out. I even pre-ordered it, wanting to devour it upon its release but I never had time. "Divergent" was one of the most hyped young adult novels this year, it didn't hurt that the movie rights were already picked up by Summit Entertainment (the studio behind the "Twilight" films). I actually want to hit myself at the moment for waiting so long to read "Divergent" because if there is one book that lives up to the hype [so far] this year, it's "Divergent". Veronica Roth has truly crafted a masterpiece worthy of all the praise it is receiving (and will continue to receive). There are very few, and I mean very few, young adult books featuring a strong female main character which makes "Divergent" an even more fantastic read. Not only is Tris, also known as Beatrice, a strong female lead, she's also relatable - Roth has managed to provide readers with someone that they can understand, someone they can relate to. Tris doesn't start out as strong in the beginning; it takes time for her to reach her potential which is something I appreciated. Nothing in this book felt rushed, nothing felt unnecessary. Every single word on each page was worth savoring and boy, do I wish I'd savored them longer. 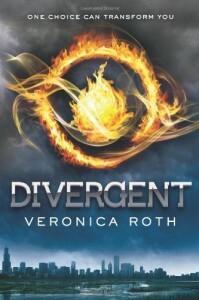 "Divergent" is a dystopian novel set in a futuristic Chicago. Society is divined into five factions: Candor (the honest), Abnegation (the selfless), Dauntless (the brave), Amity (the peaceful), and Erudite (the intelligent). Beatrice has been part of the Abnegation all her life, but upon her sixteenth birthday she is to decide if she wants to remain a part of Abnegation or transfer to another faction. It's the one choice that will change everything. In "Divergent" you will find corruption, you will find love (oh hello there, Four), but most of all you will find a story of a young girl finding herself. Sure, the action is great and so is the corruption, but it's Tris' story that really pulls you in. At least that's how it was for me. "Divergent" is an excellent debut and I can't wait to see where Roth takes this trilogy and what happens to Tris and Four along the way. If you haven't read "Divergent" yet, get to it.